The recent stretch of lower humidity and cooler days should have you amped and ready to run some races in the month of August. While it's unfortunate that running events are few and far between over the next four weeks; there's plenty to keep you busy with White Linen Night, the brand new Sushi Fest, and the kickoff for football pre-season. Most of the races that do happen in August are on the casual side, with less structure and a very party-like atmosphere. However, let's face it, every event in New Orleans ends up being a party at one point or another. Check out the list below for upcoming happenings, and click on the events' names to link to more information on their respective pages. MBA 5K (Friday, August 1st @ 6:00 p.m.) - Start August with a 5K race that begins and ends at the Lazy Magnolia Brewery in Kiln, Mississippi. Enjoy a post-race beer tasting, music, food, and kid friendly activities that include face painting and crafts! Lakefront Lighthouse Stroll 2 Mile and Half Mile (Friday, August 8th @ 6:30 p.m.) - Support the Lake Pontchartrain Basin Foundation, visit the New Basin Canal Lighthouse, and enjoy post race live band entertainment by The Prescriptions. Red Dress Run 2 Mile (Saturday, August 9th @ 9:00 a.m.) - Finding actual info on the run portion of the Red Dress Run is hit or miss. If you haven't already found your red dress, mu-mu, or evening gown yet, you're cutting it close to be properly attired. Q50 Bleau Moon 5 Mile (Saturday, August 9th @ 8:45 p.m.) - Gather a headlamp, camelback, and whistle for this night trail run through Fountainbleau State Park. Individuals or teams of 2 can join up to tackle grass and dirt terrain. 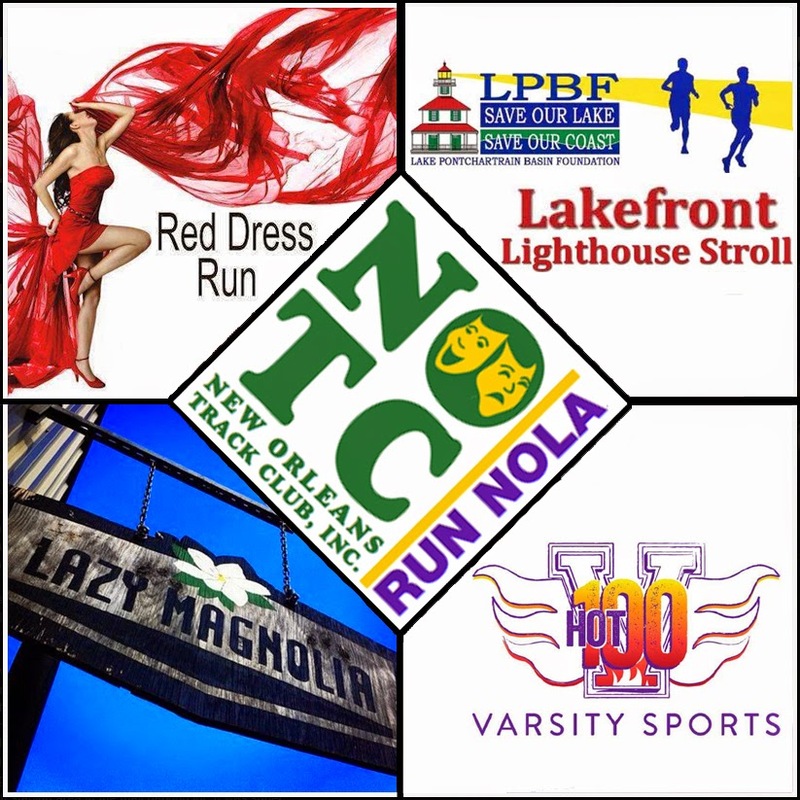 NOTC 51st Anniversary Race 3 Mile & Half Mile (Saturday, August 16th @ 8:00 a.m.) - Celebrate the history of the New Orleans Track Club with their Anniversary Race at the City Park Festival Grounds. Also, learn about racewalking during a free clinic. All pre-registered participants receive a commemorative gear bag. Also, August is the last month for participants in the Varsity Sports Hot-100 to rack up points to earn some great prizes. If you're not already registered for the challenge, it's too late for Summer of 2014; however, Varsity Sports Mandeville will be holding a 7th birthday celebration on August 9th that is open to all. Click HERE for more details as they are made available.